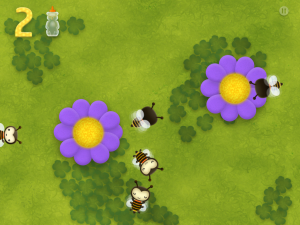 Counting Bees Review – Math can “bee” fun! 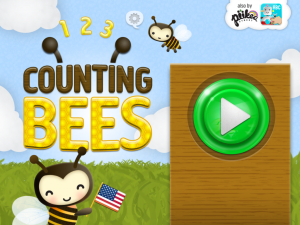 Your little one will be a busy bee learning how to count to 20 with this buzzy app! Tap and go – besides number recognition, there is no reading required to play this game. My two kids are completely unaffected by the presence of bees. Or any bug, really. They’re smack-dab in the middle of the phase where every single bug is The Most Interesting Thing Ever. Thankfully they’ve never been stung or bitten or whatever it is that bugs do so it’s almost fun to watch them bend over and get within an inch of some of the grossest bugs I have ever seen. Counting Bees takes the sting (get it?) out of, well, counting bees. Let me just say that if all bees were as nice as these bright and cheery animations, I wouldn’t mind one bit if my preschooler tried poking it multiple times. By a healthy margin, this is one of the most comprehensive counting apps on the market for the 2-4 crowd. in a straight line (Type A 4-year-old method) or pull a loop-de-loop (melodramatic 2-year-old technique). The only downside that I’ve encountered is that the iTunes description states that the game is intended for players aged 2-7. Honestly I think that the kiddos on the upper end of this range will be really bored; there are several other math apps (Rocket Math is a good one) that cater to the school-aged players. If you are looking for a cute counting app for your toddler or preschooler then this a well-priced, age-appropriate choice. household, but for those teaching their young ones a foreign language this would be a great addition to a repertoire of supplemental learning tools. – Relaxing Ukulele music plays as your child is encouraged to help and learn. – Special configuration option for parents to enable the languages they are most interested in their kids learning.